Please note that we have a change of venue for this month’s Lighthouse Club – Yangon branch networking event. We are also back having the event on Wednesday. 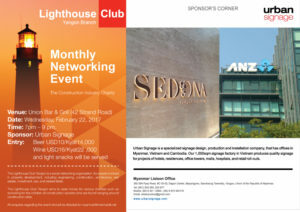 This month it will be held at “Union Bar” at 42 Strand Road, 7 – 9 pm Wednesday, 22 February. Thanks to this month’s sponsor Urban Signage. Thank you. All are welcome.